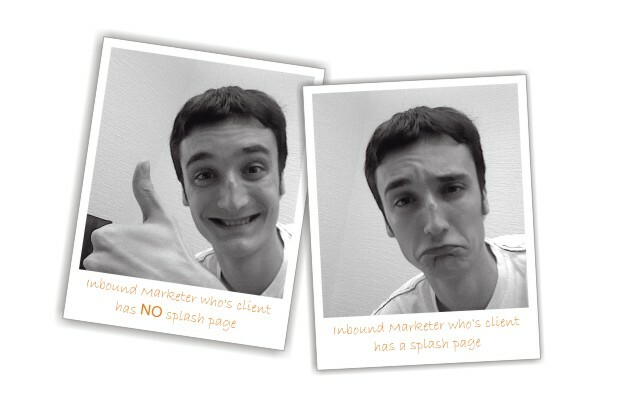 Intro pages also known as splash pages are pages that most often serve as a welcome message on a website’s homepage. Intro pages are usually made using flash technology or featuring one big image. There are a lot of reasons why you shouldn’t have intro / splash page on your website. Let’s start with usability problems. Welcome to Example.com, click here to enter! It might look nice to you as a website owner but a visitor will be pretty annoyed by the fact that he / she has to make one more click to enter your website every time he / she pays you a visit. A visitor already came to your website which means he / she wants to see your website’s content, not a message telling him that he should enter. Visitor came to find some sort of information and there is no reason why the information wouldn’t be accessible without extra click. Intro pages often feature pretty big images or flash files taking lots of time to load on slower connections. A visitor visiting your website will not appreciate the fact he or she has to wait for these images to load. These images or flash intros will in fact unnecessarily spend not just your visitor’s bandwidth but also your web hosting bandwidth making you pay more to your hosting company. Now, these were just a few usability issues with intro pages but this is nothing compared to what it does to your website’s SEO. Every link has a certain degradation factor attached to it when passing page rank to the web page it links in order to avoid obvious page rank flow infinite loops. This means that by having an intro page you’re actually intercepting the links that should link to your homepage and transferring only a part of that Page Rank value to the actual content via “Enter here” or similar link. These facts indicate that by having an intro page you’re intentionally devaluing all the incoming links to your homepage making you rank lower on search engines. Search engines love content. By serving them a single image or a flash intro on your website’s homepage, you don’t really seem as a relevant source of information a user would be looking for. This means you will rank lower on search engines without content. These intro pages are usually once set-up and never changed. Search engines love fresh content (lately even more then before). If your website’s homepage is the intro page, search engines might figure you don’t update your website a lot and start indexing you a lot slower. This means that whenever you would add another article, page or any sort of content to your website, you might have to wait for a long time for this page to be indexed by search engines. Flash technology has it’s problems with search engines on it’s own even when it isn’t used as a splash page. You should check out a pretty popular article from Angry Aussie about flash intro pages. It has a pretty clear graph explaining benefits and drawbacks of using flash intro pages on your website.